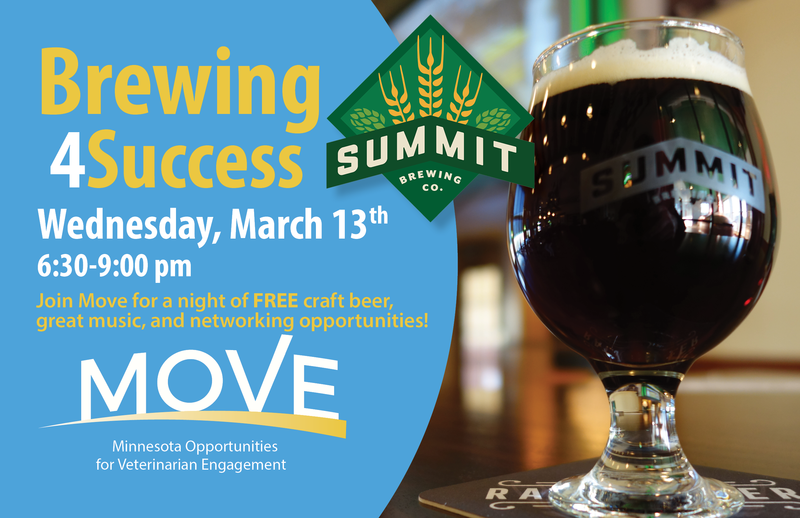 For a night of FREE craft beer, LIVE music, and great networking opportunities for young, working veterinarians. As the pilot event for the Minnesota Opportunities for Veterinary Engagement (MOVE) team, we want to invite you to come and have some fun with us. The MOVE team is the newest initiative by the Minnesota Veterinary Medical Association to support the professional success and development of veterinarians in our state. This event will focus on discussing health and wellness within your career and will feature special attendees. These individuals represent some of the most accomplished veterinarians in our state. So come enjoy a drink and network with highly successful and motivated industry leaders. After all, what better place than a brewery to begin brewing your own path to success?